Draft: 2009, Philadelphia Phillies, 9th rd. 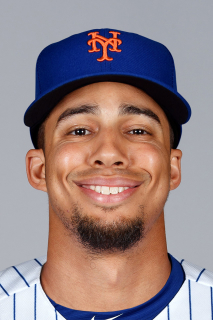 Aaron Samuel Altherr (pronounced all-TAIR)… Married Samantha Chavez (11/20/16)… 2009 graduate of Agua Fria High School (AZ), where he played baseball, basketball and golf… Hobbies: Working out, golfing, watching "King of Queens"… Signed by: Brad Holland. Made his second career Opening Day roster... Slugged his third career grand slam, 4/7 vs MIA (Dillon Peters)...Collected 2 walk-off hits: RBI single, 4/22 vs PIT (11th inning) and 2-run double, 6/18 vs STL (10th inning)...On 4/22 vs PIT, became the first Phillie to enter a game as a reserve and collect 3 or more hits, including a walk-off hit, since 2008 (Chris Coste, 8/26 vs NYM)... Slugged his second career pinch-hit home run on 5/21 vs ATL... Optioned to Lehigh Valley (AAA) on 7/22 before being recalled for remainder of season on 9/1... On 9/14 vs MIA, recorded his fourth career multi-HR game; also tied his career highs with 4 hits and 5 RBI... Made 57 ML starts: 45 in RF, 8 in CF and 4 in LF... With RISP, batted .288 (19-66), 6 2B, 5 HR, 33 RBI, 13 BB... Hit .179 (5-28), 3 2B, HR, 4 RBI, 4 BB as a pinch-hitter...Was T-4th in MLB with 4 XBH as a pinch-hitter...Batted .244 (29-119) with 5 2B, 2 HR, 12 RBI, 14 BB, 4 SB, .321 OBP in 34 games with Lehigh Valley. Established career highs in every nearly offensive category... Led the club in SLG % (.516), OPS (.856), HBP (7) and OF assists (7)... 11 of his 19 HR came in the 7th inning or later, which were the most on the team... Only 4 other NL players had more HR in innings 7-9: LAD's Cody Bellinger (17), CIN's Joey Votto (13), WSH's Ryan Zimmerman (13) and MIA's Giancarlo Stanton (12)... Among NL players with at least 350 AB, finished 5th in AVG in the 7th inning or later (.331)... Made a career-high 92 starts: 42 in LF, 38 in RF and 12 in CF... Had 2 DL stints: 7/17-25 and 8/5-9/3, both with a right hamstring strain... Had a career-best 10-game hitting streak, 6/17-28 (.318 AVG, 14-44)... Clubbed a 3-run HR in 3 straight games, 5/7-10, to become the first Phillie to do that since 1981 when Hall of Famer Mike Schmidt did it (9/30-10/3)... Collected 15 XBH in 74 AB to begin the season, becoming the first Phillie to do so since 2008 (Chase Utley - 72 AB). September 1, 2018 Philadelphia Phillies recalled CF Aaron Altherr from Lehigh Valley IronPigs. July 23, 2018 Philadelphia Phillies optioned CF Aaron Altherr to Lehigh Valley IronPigs. September 4, 2017 Aaron Altherr roster status changed by Philadelphia Phillies. September 1, 2017 Philadelphia Phillies sent OF Aaron Altherr on a rehab assignment to Lehigh Valley IronPigs. August 31, 2017 Philadelphia Phillies sent OF Aaron Altherr on a rehab assignment to Reading Fightin Phils. August 5, 2017 Philadelphia Phillies placed RF Aaron Altherr on the 10-day disabled list. Right hamstring strain. July 26, 2017 Philadelphia Phillies activated RF Aaron Altherr from the 10-day disabled list. July 17, 2017 Philadelphia Phillies placed RF Aaron Altherr on the 10-day disabled list retroactive to July 15, 2017. Strained right hamstring. July 17, 2017 Philadelphia Phillies placed RF Aaron Altherr on the 10-day disabled list retroactive to July 15, 2016. Strained right hamstring. July 28, 2016 Philadelphia Phillies activated RF Aaron Altherr from the 10-day disabled list. July 25, 2016 Philadelphia Phillies sent OF Aaron Altherr on a rehab assignment to Lehigh Valley IronPigs. July 21, 2016 Philadelphia Phillies sent OF Aaron Altherr on a rehab assignment to Reading Fightin Phils. July 18, 2016 Philadelphia Phillies sent OF Aaron Altherr on a rehab assignment to Clearwater Threshers. July 8, 2016 sent OF Aaron Altherr on a rehab assignment to GCL Phillies. August 18, 2015 Philadelphia Phillies recalled CF Aaron Altherr from Lehigh Valley IronPigs. June 23, 2015 CF Aaron Altherr assigned to Lehigh Valley IronPigs from Reading Fightin Phils. March 16, 2015 Philadelphia Phillies optioned CF Aaron Altherr to Reading Fightin Phils. October 9, 2014 OF Aaron Altherr assigned to Aguilas del Zulia. September 29, 2014 Philadelphia Phillies recalled Aaron Altherr from Reading Fightin Phils. July 4, 2014 Philadelphia Phillies optioned CF Aaron Altherr to Reading Fightin Phils. July 2, 2014 Philadelphia Phillies recalled Aaron Altherr from Reading Fightin Phils. June 19, 2014 Philadelphia Phillies optioned LF Aaron Altherr to Reading Fightin Phils. June 16, 2014 Philadelphia Phillies recalled Aaron Altherr from Reading Fightin Phils. April 21, 2014 LF Aaron Altherr assigned to Reading Fightin Phils from Clearwater Threshers. April 13, 2014 LF Aaron Altherr assigned to Clearwater Threshers from Reading Fightin Phils. March 30, 2014 Reading Fightin Phils placed LF Aaron Altherr on the 7-day disabled list. March 10, 2014 Philadelphia Phillies optioned LF Aaron Altherr to Reading Fightin Phils. November 20, 2013 Philadelphia Phillies selected the contract of Aaron Altherr from Clearwater Threshers. May 16, 2013 Aaron Altherr roster status changed by Clearwater Threshers. May 12, 2013 Clearwater Threshers placed CF Aaron Altherr on the temporarily inactive list. April 3, 2013 CF Aaron Altherr assigned to Clearwater Threshers from Lakewood BlueClaws. August 18, 2012 Aaron Altherr roster status changed by Lakewood BlueClaws. March 31, 2012 CF Aaron Altherr assigned to Lakewood BlueClaws from Williamsport Crosscutters. June 10, 2011 Aaron Altherr assigned to Williamsport Crosscutters from Lakewood BlueClaws. April 2, 2011 Aaron Altherr assigned to Lakewood BlueClaws from Williamsport Crosscutters. July 22, 2010 Aaron Altherr assigned to Williamsport Crosscutters from GCL Phillies. July 9, 2009 Aaron Altherr assigned to GCL Phillies from Philadelphia Phillies. July 7, 2009 Philadelphia Phillies signed Aaron Altherr.